Reliable Foot Comfort. 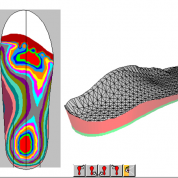 Advanced technology allows us to precisely cast, design and manufacture your custom foot orthotic. Available in a broad array of materials, these devices can be specified to address most any foot anomaly. Whether to simply improve comfort, address gait issues, or to heal an acute pathology, they are able to proved the best results. Orhtotics only work if your patient wears them. By using the latest in scanning, editing and manufacturing technologies, we can ensure the highest patient acceptance. Our unique technology automatically off-loads pressure points and allows for precise biomechanical alignment through your entire gait cycle. Accommodative. Our EVA devices are individually machines to ensure perfect fit. Available in four densities with a variety of topping materials, these devices are ideal for a wide range of lifestyles and pathologies. Diabetic. Our contact digitizing technology automatically off-loads pressure which ensures the best possible weight distribution across the plantar surface of your foot. This minimizes the risk of abrasion and ulceration. Poly-Pro Functional. these orthotics are custom machined out of a solid block of polypropylene material. 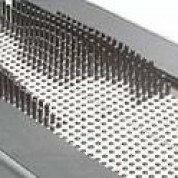 They feature integral heel posts with the right amount of medial skiving for precise function and control. The stiffness is completely adjustable and reproduceable for predictable results….every time! Stealth Carbon Fiber Functional. Super strong, super light, super thin. Our carbon fiber devices are ideal for plantar fasciitis or any case where maximum control is needed. These devices consist of a custom molded rigid or semi-flex carbon fiber orthotic with a neutral posted, shock absorbing heel and full or 3/4 length topping material. It is the ultimate foot orthotic!